Dengue cases which hit a six year high in July may show a decline with island -wide programmes to eradicate mosquito breeding sites, health authorities say. 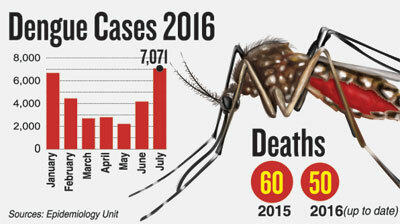 Earlier, last month the number of dengue patients skyrocketed to 7,071 cases, the highest figure that was seen since 2010. Authorities said that hospitals particularly in the Western Province were flooded with patients and some hospitals did not have the capacity to ward them, while some were faced with a shortage of staff. The Dengue ward matrons at the Base Hospital, Angoda (Infectious Disease Hospital), told the Sunday Times that during the month of July, because of the many suspected dengue patients who were admitted to the hospital, they ran out of beds. “We had to keep three patients on one bed because of the lack of space,” Nursing officer of Ward five of the hospital, Ravin Nilanka Perera said. He added that the hospital also faced a shortage of staff and had brought in third year student nurses, nurses from the Navy hospital and the Angoda mental hospital. The nurses from the other dengue wards of the hospital shared the same story. According to them at times there were patients being treated along the corridors of the hospital. Health authorities attributed this drastic increase to the floods that occurred during the last few months. Apart from this, the disruption of proper garbage collection at the time and the inability to carry out fogging to a hundred percent had been contributing factors. National Dengue Control Unit consultant community physician Dr. Preshila Samaraweera, stated that the cases increased after the floods and once they increased they couldn’t be brought down. However, now the situation is slowly being brought under control and mass fogging is being carried out in Colombo, Kandy, Kalutara and Gampaha which are high risk dengue areas. Dr. Samaraweera added that they are worried about the schools due to the high risk following the figures that the last dengue programme showed. “At present the cases are reducing but following our reports after the last programme there were plenty of places, where potential mosquito breeding places were abundant in schools. Children can get infected by this if immediate measures are not taken and the cases can go up again. So we are planning to do another programme before schools start,” she said. Dr. Samaraweera stated that the households are taking precautions in comparison to the schools and other institutions. “There should be some commitment by the community, who are responsible for these breeding grounds existing,” Dr. Samaraweera said. “Another reason for the rise in the figures, might have been the fact that we couldn’t do the case-based fogging to a 100 percent, because of the high case load, Dr. Samaraweera said. She added that usually if they are notified of a case, the authorities have to fog that area within three days, but when the cases were high this was a difficult task, because of the shortage of staff. They even had to bring in staff from the North and South of the country to carry out the fogging. Following concerns, the authorities are also planning a second national mosquito eradication programme on August 11, 12 and 13, targeting the North East monsoonal rains.